So, I was meeting with a 14 y/o soccer player referred to me by a physical therapist today who is need of sports performance conditioning (return to play) work after a lateral release. This talented female athlete suffers from a shallow trochlear groove, thereby making her more prone to patella subluxations. Such an incident led to two recent surgeries and nearly a year away from the soccer field. She has returned to soccer, but has been referred to me for prevention and performance work. I have been thinking about her program, history and all the athletes I have trained in recent memory with knee problems. I also recall reading an email this weekend from a past intern asking me if there was a single leg training certification out there as she saw me do so much of it at my facility. These thoughts lead me to my post today. 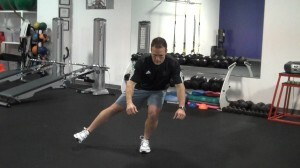 If you are a jumping, cutting or competitive athlete using your legs to perform, you should absolutely be integrating single leg training into your conditioning programs. Why, do I say so? The answer is rather simple in my mind. The human body is often out of balance. The brain is so adept at mastering movement, it learns to compensate for even the slightest deficits on one side. Over time, you end up grooving improper motor patterns and these tend to lead to small imbalances or even overuse issues. Ever hear about stretch weakness or adaptive shortening? Maybe you are familiar with the terms overactive and under active muscles? Regardless, I can assure you that at any given moment, your body may be susceptible to these patterns. Through a poper single leg assessment, I see many issues come to light that may otherwise be hidden with two legged squats, lunges, leg press, etc. Let me go back to the young lady sitting in my office this morning. She has bilateral shallow trochlear grooves, yet only one knee to date has given way. Why so? Will the other one follow suit? There is no way to definitively predict if her other knee will become problematic. But, my hunch is there were some single sided imbalances that may have led to her current injury history. It is now my job to try my best to prevent such an episode on her other knee, as well as make sure she does not have issues on the surgically repaired side. Anything short of a program heavy on single leg work would be a mistake for her (and many others like her). You see, we often reinforce imbalances and poor technique with heavy squatting, lunging and dead lifts seen in traditional programs. I am not oppose dot these lifts – in fact they can be great for strength and power development. However, we MUST address and correct the single sided imbalances first. We must also always include some single leg strength work with our athletes to ensure there is no asymmetry developed unknowingly. Most athletes compete using their own body weight. We must train in such a way that we foster control, power and mastery of movement with each limb. 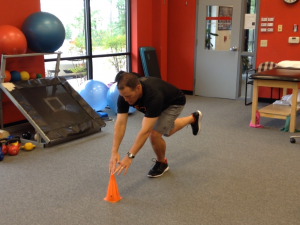 This focus and approach will be most helpful in reducing injuries like ankle sprains, ACL tears, muscle strains and common overuse issues in the lower extremity. So, next time you think about performance training, I want you to consider the importance and relevance of single leg training. No program is perfect. But, I will tell you my track record is pretty solid with prevention, performance and return to play training I have done that relies heavily on this approach to conditioning. Stay tuned as later this week I will unveil my latest DVD as well as review how traction with footwear affects lower limb joint loading. Well, with Turkey Day nearly upon us, I am gearing up for a 4 miler on Thursday morning. I have run 5Ks, 10Ks and half marathons, but this will be my first 4 miler. They give you a bottle of wine at the end of this one so it is pretty popular in my neck of the woods. As I expand my own running and train more and more runners, I often find that many lack good single leg stability and hip strength. If you are a runner and not doing any strength training or simply focusing on traditional machine-based exercise, you need to shift gears and incorporate single leg exercises to maximize performance and prevent injuries. I hope you can put these exercises to good use. They are great for increasing stance leg strength and stability, while simultaneously improving swing leg strength and mobility. Happy running and have a great Thanksgiving everyone!